The two-day event presented a world-class program that featured inspiring speeches and panel discussions by global icons across business and entertainment. The conference drew in over 5,000 attendees and has been refereed as “a master in class disruption”. 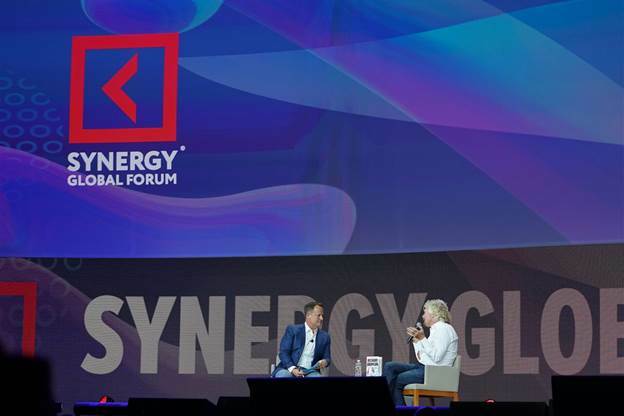 Synergy Global Forum debuted its first North American conference event this past weekend, October 27 and 28, 2017 at the iconic Madison Square Garden Theater. Established in 2015, Synergy Global Forum is known as one of the world’s premier business events offering professionals and entrepreneurs an unrivaled conference experience to network, share, grow and learn from the brightest minds across industries globally. The 2017 theme, “A Master Class in Disruption” was headlined by Sir Richard Branson among other notable industry leaders. The 5,000 people in attendance at The Theater at Madison Square Garden experienced a once and a lifetime opportunity to gain insight and knowledge from speeches and panels given by some of the world’s most famous thought leaders. Sir Richard Branson, Gary Vaynerchuk, Malcolm Gladwell, Jack Welch, Steve Forbes, Naveen Jain, Robin Wright, Simon Sinek, Daniel Goleman, Nassim Taleb, Ray Kurzweil, Guy Kawasaki and Jordan Belfort all gave stirring talks on topics ranging from ending fake news to ending disease. In addition to speeches from those legends, attendees were treated to four illuminating panels filled with the country’s most prominent venture capitalists, startup founders, media personalities and social media influencers. On Saturday, the event was the fifth most trending topic on Twitter in the NYC region. In addition, the event was also shared on Instagram more than 500 times using the #SGYNYC over the past two days. The next Forum event, a live master-class led by Jordan Belfort, will be held in New York City on January 26, 2018. For more information and tickets visit: http://synergyglobal.com/.